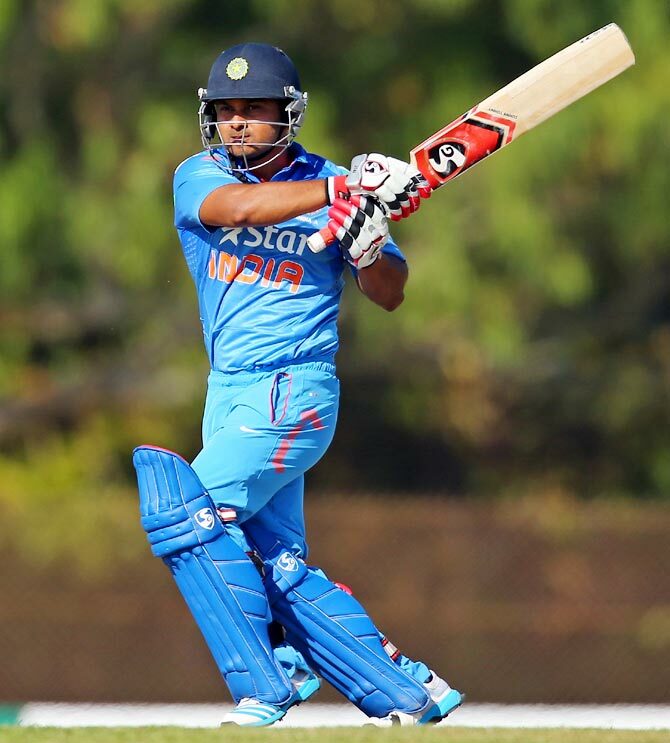 Kedar Jadhav, Manoj Tiwary and Rishi Dhawan hit half-centuries to lift India 'A' to a thrilling four-wicket victory against Australia 'A' in the final of the Quadrangular A-Team One-Day Series at Marrara Oval, in Darwin, on Saturday. Electing to bat first, Australia 'A' posted a competitive 274 for five in their 50 overs courtesy of captain Cameron White's splendid century. In reply, India 'A' lost a few early wickets before they recovered to score 275 for six in 48.4 overs. Image: India 'A' players celebrate with the trophy after winning the Quadrangular A-Team One-Day Series in Darwin, on Saturday. For Australia 'A', skipper White led from the front with the bat. He smashed a magnificent 137, hitting 10 fours and five sixes in his 150-ball knock, to help the hosts post a challenging total. 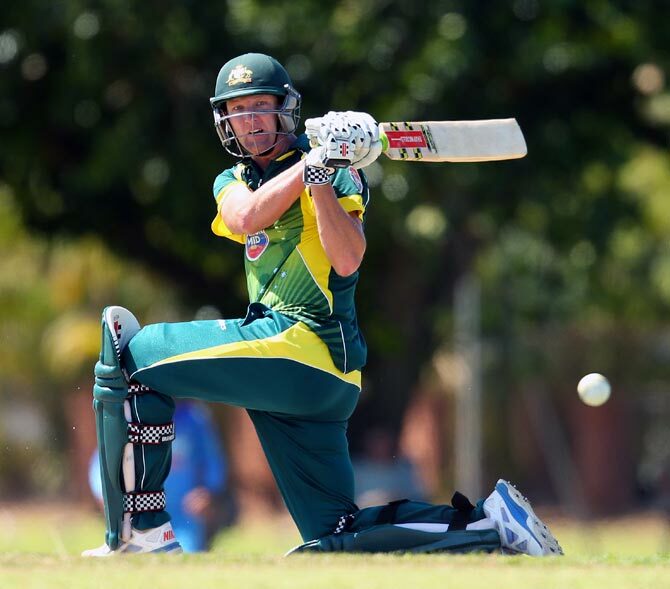 White and his opening partner Phillip Hughes (51) had rattled up a 146-run stand to provide Australia 'A' with a solid start. Once Huges was dismissed by Dhawal Kulkarni (3/51), Australia's middle order struggled to maintain the momentum before Ben Cutting provided the late boost with a quickfire innings of 35 from 21 balls. India struggled at the start of their innings as they lost a few early wickets to be reduced to 51 for three in the 11th over. Manan Vohra was run out for eight, while captain Robin Uthappa was caught behind off Kane Richardson for 12. Ambati Rayudu was dismissed leg before wicket by Ben Cutting for seven to leave the visitors in trouble. Tiwary and Jadhav rescued India 'A' as they both hit half-centuries. Tiwary played a steady innings of 50 from 75 balls, while Jadhav was a bit more positive at the other end as he smashed 78 from 73 balls, hitting six fours and two sixes. Both were dismissed by pacer Cutting, who took three for 46 in 10 overs. The wicket of Jadhav left India in a spot of bother at 182 for six in the 37th over. Rishi Dhawan and Akshar Patel pulled off a sensation run chase in the final overs to lead their team to victory with eight balls to spare. Dhawan slammed 56 not out from 55 balls, while Patel hit a quickfire 45 from 38 balls as the duo were involved in an unbroken stand of 93 runs from 75 balls for the seventh wicket to help India clinch the trophy. Fall of wickets: 1-146 (Hughes), 2-220 (Doolan), 3-225 (White), 4-233 (Henriques), 5-237 (Marsh). Bowling: M Sharma 10-1-55-1, D Kulkarni 10-0-51-3, R Dhawan 5-1-30-0, A Patel 10-0-47-1, M Tiwary 5-0-34-0, K Sharma 10-0-48-0. Fall of wickets: 1-26 (Vohra), 2-26 (Uthappa), 3-51 (Rayudu), 4-133 (Tiwary), 5-161 (Samson), 6-182 (Jadhav). Bowling: K Richardson 10-0-58-1, C McKay 9.4-0-57-0, B Cutting 10-0-46-3, M Marsh 6-0-34-0, C Boyce 6-0-48-0, M Henriques 7-0-30-0. Dhoni hits new low: Most Test defeats as India captain vs England!